Does your Smashwords ebook contain navigation? Are you taking full advantage of navigation? 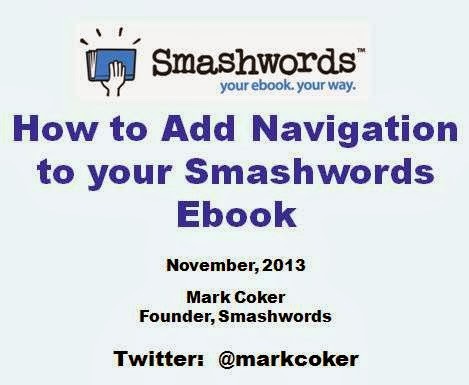 This afternoon I produced and uploaded a new Smashwords tutorial video that shows you how to add navigation to your Smashwords ebook. One of the advantages of ebooks over print books is that ebooks can contain navigation. Hyperlinks within your book can link to chapters, Parts, or special sections. These links make your book more accessible to readers. You can also use links to draw your reader's attention to important end matter (a.k.a. back matter) sections of the book that help you sell more books. Few authors take full advantage of their end matter. Some authors will simply end their book with the words, "The End" and then leave the reader hanging at the very moment the reader wants more. Give them more! 1. About the author - place a short bio here so readers can learn more about you. 2. Other books by this author - The reader just finished your book and is craving more from you. Tell them about your other books. If you have a book on preorder, let them know the preorder is available at select retailers (Smashwords distributes preorders to Apple, Barnes & Noble and Kobo). 3. Connect with the Author - The reader loved your book, they think you're the bees knees, and they want to connect with you. Add your coordinates for Facebook, Twitter, your blog, your website, your Smashwords Interview, your Smashwords author page, or your mailing list. Once a reader connects with you via social media, they can start to get to know you and appreciate your super-awesomeness on an entirely new level. It's an opportunity for you to start a long term relationship building process that can help casual readers become fans, and help fans grow to become super fans. 4. Sample chapters of other books - Give them a taste of your other books! 5. Reading group guide - Create a special section for reading groups with suggested questions that would spark thought-provoking discussion and debate. This is an opportunity to turn one reader into many, because it'll encourage reading group members to propose your book as the group's next read. Your book might already have one or more of these sections. If you don't have them all, consider upgrading your book with these new end matter sections, and with a linked ToC to tie them altogether. The video, and the recently updated Style Guide, will give you ideas to take your book to the next level. Special thanks to Smashwords bestseller Samantha Towle. Samantha gave me permission to use her new contemporary romance, Trouble, in the creation of this video. I used her book as an example of how to add useful navigation in Microsoft Word. More than just about any book, box sets really need a robust NCX, which is the book's external Table of Contents you see whenever you click the Table of Contents option on your ereader device. The secret to creating a great NCX is to start with a logical Linked Table of Contents. As we mention in Step 20 of the Style Guide (the section that explains how to add navigation) and video above, when you create a linked Table of Contents, Meatgrinder will use your linked ToC to guide the creation of the NCX. This gives you great control. Each of the items above would be hyperlinked, with the hyperlinks pointing to the bookmarks corresponding to the start of each section. In the example above, we'd identified the start of each key section. If you want to go further, you could even link to the primary subsections within each book, though be careful not to go overboard because too much navigation can become overwhelming to the reader. 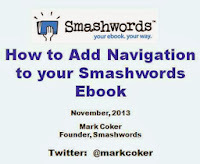 See the YouTube video on Smashwords navigation to see the navigation creation process in action. Once you see how to do it, it's easy and the final result will give your readers a great navigation experience. How to get multiple authors in the metadata: Smashwords can connect multiple authors to your box set. Simply gather the hyperlinks for each participating author's author profile page at Smashwords and send the request with the hyperlinks to the Smashwords support team. You'll find the link to the support team at the bottom of any Smashwords website page, or by clicking the question "?" mark at the top of any page. The Smashwords Style Guide, and the video tutorial above, show how to create navigation using the PC versions of Microsoft Word. If you use a Mac, the same principles of navigation as explained above, and in the Style Guide and video, also apply to Mac Word users. However, the menus within Word for Mac are different. The image below shows the location of the options that allow bookmarking and hyperlinking. Click the image to expand. Great tips. I think a lot of authors forget the benefits to hyperlinks in their About the Author page that goes to their website, blog, and favorite social media links. A Smashwords author emailed me with questions about how to locate the bookmark and hyperlink features within Word for the Mac. I updated the post with a screen shot and instructions. Here are the written instructions: In Word for Mac, the menu ribbon along the top is different than the ribbon menu for the PC versions of Word. At the very top of the screen in Word for Mac, you'll see "Insert". That's where you'll click to insert bookmarks. You'll click Insert then click Bookmark. As a reminder, you'll always create Bookmarks before you link to them from your ToC. To create a hyperlink in your ToC that links *to* the bookmark location, highlight the item in your ToC you want to link (such as Prologue or Chapter One or About the Author, etc. ), click Insert at the top of your Word screen, then click Hyperlink, then in the middle of the page after clicking Insert: Hyperlink, you'll see the options for Web Page | Document | Email Address. Click Document. Next, under the Anchor heading on that same window, click Locate, and then click the down arrow for Bookmarks. There, you'll see your bookmarks. In my experience with putting hyperlinks at the end of eBooks is that retailers such as Apple will reject your book because of it. I've had that happen on a number of occasions, so I stopped putting links of any kind at the end of my books. At one stage I used to simply place a link at the end navigating to my Smashwords author page, but got rejected for that as well, by vetters at Smashwords. Has this recently changed? Darren, Apple doesn't want to see language or links that encourage their customer to go elsewhere to buy a book. So, for example, "Visit my web site at http://" or "Visit my Smashwords author page at http://" is okay, but "Buy my other books at my website" or "Buy my books at [name your destination/retailer]" is not okay. "Buy my books at fine ebook retailers everywhere" is okay. "Available for preorder at select retailers" is also okay. The updated Style Guide has more information on back matter. I am a Mac user. Your explanation in the tutorial video was very helpful. The update and images for Mac users was extremely beneficial. I have now tested the principles of navigation in a manuscript. They work great! I plan to incorporate them in my next book. Thank you, Mark! Thanks, Karen, great to hear! I too have had an issue with getting an Apple ticket for hyperlinks leading to my Smashwords pages and one to my author blog. None to other sales outlets. It seems very inconsistent. There was no language about sales, only the title and the link to Smashwords. I deleted all links from that title and will not use them in new titles but I dread having to change all 13 titles already published. I think there needs to be clarity with Apple about what 'competition links' means. Surely they don't see Smashwords as competition? Will I be able to link to associated audio files from an ebook? If so, how to submit the the audio files with the document? And will the audio files play from within the ebook on an iPad or Kindle? In this vein I wonder if it is useful to make links from chapter-titles back to the ToC, so readers can jump up and down. I've seen a few books with that feature, but can't decide if that's at all useful. @David, Apple has been increasing their crackdown and scope of what they deem "competitive links." Links to Smashwords are still fine, but it depends on the context and the language surrounding the link. "Buy my book at Smashwords" is not okay because Apple doesn't want the book to drive their customers to other purchase venues. "Visit my author page at Smashwords" followed by a link to your author page is perfectly fine. Apple's main concern, which is understandable, is that it's confusing to their customers when a book they're reading encourages them to go to another store to buy other books by the same author. Our Apple Ticket Help Page page has a section on recommendations to help you. We'll continue to update the guidance on that page to keep it current, because requirements can change over time. It shouldn't be necessary to update books that have been previously accepted and listed by Apple unless Apple's QA team gives you a ticket requesting the change. 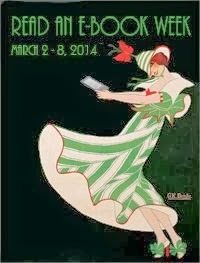 The <a href="https://www.smashwords.com/books/view/52>Smashwords Style Guide</a> also has updated recommendations on how link to Smashwords, your website, blog or social media sites. @LL - We don't support audio files inside the book. I don't know if this would work for you, but if your book could include an appendix of supplemental resources, you could link to a blog or some other online archive to provide links to your audio as long as access to that audio is free and doesn't require purchase or registration. Such a resource should also *not* be advertised or promised in your book description, because you'd run the risk of promising something that not all e-reading devices may support. That's why I'd recommend the language around your appendix point to these resources as supplemental for those with devices that support it. @paganpaul - Great question! Here's my personal opinion, though the choice is entirely up to you: For fiction, I think it's best to not link your chapter headings back up to the ToC, because fiction is read serially from page one forward and readers will have little reason to link to the top. Also keep in mind that too many links in the body of the book can become like landmines that readers might accidentally tap or click and be pulled out of the book, or out of their location. For non-fiction, especially reference works where readers will access your material non-sequentially, I think links back to the ToC can be very useful. For example, in the Smashwords Style Guide you'll see many "Back to top" links. Thanks for the information, Mark. That's what I've been doing with my printed book, "Learn Chinese through Songs and Rhymes", viz. asking my readers to download the audio files from the Internet. It would be so much better if the reader could just click on a link in the ebook and listen to the corresponding audio. I found this so much easier being talked through the process. Thanks for the superb tutorial. Although the style guide is very well written, following the video tutorial was extremely helpful. I found myself going back and forth between the tutorial and my book, "Amanda's Room." I was disappointed to learn that a ticket from Apple prevented my book from being distributed through them and believe the source may well have been due to issues with the bookmarks and hyperlinks. Thanks so much for making these resources available. All I had was a link to my blog at the end of the book. iTunes ticketed those books. For the two books a year I sell on iTunes and the three a year I sell on SW, there comes a point where it's just not worth it. I've heard of similar problems with hyperlinks and haven't used them up to now because of that. Would the book be accepted with the hyperlinks to the different retailers? I don't see any other way to do it, but if there is, I'm all ears. I'm on my 17th book with Smashwords and still cannot understand where authors can download a 100% full copy of my book in epub format so I can check it. Also reader FAQS need to be separated from author FAQS. having them converged makes them unsearchable, hundreds of incidents of the search term epub, for example. Bruce, as the author, you're able to download your own book from your book's book page. 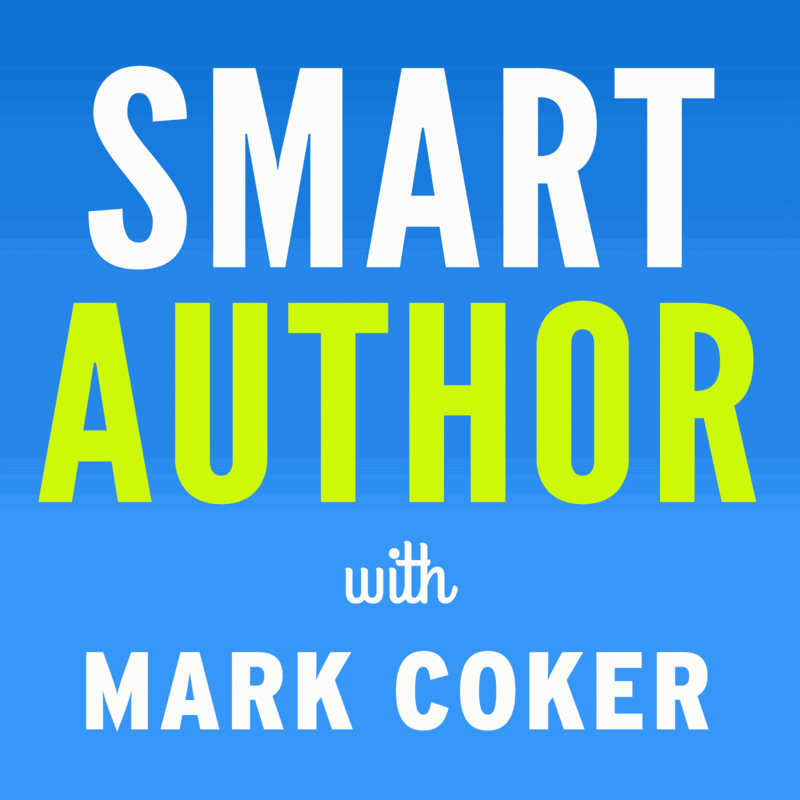 Each time you publish a book, the screen will give you a link to your book page. You'll also receive an email confirmation with a link to your book page. If you're not receiving this confirmation email, check your spam filters. You can also always click to your book page from your Dashboard. The FAQ is divided into sections. At the top of the FAQ page you'll find a table of contents with links to each section. The reader-centric part of the FAQ is only the first section. I hope that helps! Why can't Metagrinder simply use MS Word's build-in TOC, which is generated automatically and correctly without having to manually creating the TOC, which is tedious and error-prone? I wrote an ebook with 4 other writers. But I don't know that how can I mention all of them at this site? Anyone can help me regarding this matter? I want to link all the terms in my text to the glossary, and after the reader clicks and sees the definition, s/he needs to return to the same place in the book as before. How can I do this? After bookmarking/linking the endnote from the text to the glossary, how to link back to the text that the reader clicked on? Thanks a lot, I'm doing my best to format it right. Hi Howard, you should be able to do this by using bookmarks preceded by the "ref_..." which will cause Meatgrinder to ignore the links when constructing the ncx but still allow the links in the body of the ebook. You can link from terms in the body to the term in the glossary, and then link from the glossary item back to the item in the body. So you'd have two sets of bookmarks, one for the initial target (the term in the glossary) and the other bookmark target would be the link that takes the reader from the glossary term back to the body of the book where the reader originated from. The bookmarks would obviously have different names, like ref_termgloss and ref_termbody. Aartiana, I haven't worked with the limited version so I'm not sure. What you're proposing will probably work, though another option should be to simply save the Libre Office file as a .doc. If you email me your final file (mc@....) I'll be happy to take a quick look or you can also contact our support team (click the ? At the top of any page). Or, if you think it looks good you can also upload it then inspect and iterate. Oh - I didn't see your response, and thought I would delete it before you saw it. Sorry about that. To backtrack, I have MS Word Starter 2010 and I learned that there is no way in this program you can create bookmarks. You are SO COOL to offer - wow!! :-) However, I reached out to another who is helping me with her MS Word 2007 Enterprise. After all the warnings in the Style Guide, I just didn't want to take a risk of messing up everything. I also hear there are ways to get MS Word 2007 onto your system, so that is also being looked at for the future since I hope to actually write more Ebooks! Thanks Mark - you ROCK!!! but that one tm_,.. (many numbers) are appearing instead of "contents" and it then goes to end of the book.. Can you please guide me? Tks a lot.. I'm Isabelita Castilho author of All The Secrets of Getting a New Job in Dubai! UNLEASHED! Hi Isa, great to hear our resources have been helpful to you. If my 20 minute video above on navigation isn't sufficient to help you troubleshoot the issue, I'd recommend you contact the Smashwords service team by clicking the "?" icon at the top of any Smashwords page. By contacting us over that form, it attaches all your book and account information to the query and makes it easy for us to pinpoint the solution to your problem. Keep in mind we're headed into the Christmas weekend so you may not hear back until early next week. What is an NCX? I read that "box sets really need a robust NCX, which is the book's external Table of Contents you see whenever you click the Table of Contents option on your ereader device," but I don't know what is meant nor how to find the answer. I'd like to do a box set (5 volumes) so I need to know. Wayne, an NCX is basically just your Table of Contents. I like to put mine up front right after the copyright page. For a boxed set, I would do a Table of Contents for each book in the boxed set, so if someone wanted to read Book 3 first, they could click directly to it. All a Table of Contents does is make it easy for the reader to go directly to whatever they want. I haven't done a boxed set, but I would first do one for every book in the set. I would make each link good for the title page of each book. So Book 1's title page would link to the first book's title in the Table of Contents. After linking to the title page of each book in the Table of Contents, I would add another link to the last page in the entire document on where to find the author(s) to help advertise the author(s) other works. You can also add a Table of Contents for each book in the set if you want to further break things down for your readers. At Book 1, I would do a Table of Contents for every chapter in Book 1. I would put this Table of Contents right after the title page for Book 1. Then at Book 2, I would do a Table of Contents for every chapter in Book 2 right after the title page for Book 2. And etc, etc... In a boxed set, I don't know if you need to do a Table of Contents for every single book in the set, but to err on the side of caution, I would. At any rate, it wouldn't hurt anything to add them. The video and instructions above do an excellent job of explaining how to make the Table of Contents (aka NCX). Thanks again for sharing your smarts, Ruth! Thanks for pointing out the proper way to do this, Mark. I eventually will get around to making boxed sets. I have the greatest difficulty getting answers to my emails from Smashwords, but some may be stupid questions. I'm not great with all the PC speak. What I can't figure out, is when I do bookmarks as per Mark's youtube video, I can't figure out if I must physically put in all the chapters under "Contents" and then split the page and follow Mark's procedure to add the chapters from within the body of the manuscript. I put in the bookmarks as per instructions--c1,c2 etc. but when I get to c10 or c11 etc, those chapters come after c1 and before c2. Is this okay and will it be in the correct order in the table of contents? Okay, I've figured out both problems, but perhaps Smashwords should make it clearer. As for the chapter numbers mixing up, it doesn't matter, but it does make the process more time-consuming. I don't know if that helps. I could be misunderstanding what you're saying. :) I'm glad you figured out the problems. The Table of Contents was one of the biggest hurdles I had to overcome in formatting. I know it's tricky. This may not be the right category for my comment/question--if so, please excuse me--but I've just FINALLY succeeded in getting an approved upload for my book. Smashwords says all systems are go! Then I discover, to my great dismay, that Smashwords offers only ebooks. I always had thought that there was a POD option so that the book could be purchased as a paperback. Was I totally wrong about this? Is there no way for people to purchase a paperback copy of my book??? Thank you, Ruth. Sorry, I've only just seen your response. Yes, that's exactly what I mean. I'm hoping it doesn't matter when I actually publish it on Smashwords. Is there an updated current version of instructions for Mac users? hotmail123, on your book's page, you should see "Download the full versions of this book" to right of the sample offering. Click on the epub option. That should send you to a link to download it. Click that link, and it should go to your downloads on your computer. On my Mac, it goes to the top right corner of my web browser that has an arrow pointing down. Mark, If I do want to have a fiction boxed set with three TOCs, one in each book with chapters, like Chapter One, Chapter Two, I'm finding that the TOCs in each book work fine, but the NCX TOC won't repeat the same word, so I can't have Chapter One, Chapter Two occur three times, one time for each book, and I don't know how to nest those in the NCX under each of the three book titles (as I've seen done by others who probably have something more sophisticated than my Word). So the NCX just leaves any duplicates out of the Meta TOC, so the first short book only has six chapters and the NCX cheerfully lists those and then when you click Chapter Seven, you are in the next book which goes on until Chapter 30. Then anything special that is not in that book, like A Note to Readers that appears only in Book 3 is also on the NCX. So simply no duplicates. I will delete the three TOCs because I can't find a solution, even after asking Smashwords support for help, but there should be a way, yes? I just haven't figued out how people do it.